Not sure if your radiology report was thorough or accurate? Long waiting times to receive your radiology reports? Have your radiology images reviewed by international expert radiologists at prices starting at $17.99. Receive your radiology report in 3 easy steps, sent right to your mobile. 2. Select the country you’d like your radiologist to be qualified in. 3. We send back your report in 24 hours, guaranteed. What is a second opinion and when should I seek one? Once you have had an imaging examination like an MRI, CT, X-Ray, or similar, you or your doctor will usually receive a report from a radiologist that has reviewed that image. A second opinion is when an additional subspecialty radiologist provides a second interpretation or review of the images, or if the images have never been reviewed, the first review. Oftentimes patients face a challenging or difficult diagnosis or treatment, and may want to double check the results before undergoing significant treatment. Moreover, sometimes radiologists over- or under-diagnose or even misdiagnose the findings in your images, especially when specialty radiologists have not had the chance to review the exams. The revision rate is substantive and can range anywhere from 8 percent to 30 percent. A second opinion can provide a different perspective on your images or confirm the original opinion provided by your first radiologist is correct, both of which are valuable when your health is at stake. Who are the Radiologists that will read my study and where are they from? With the AlemHealth Network, you can specify which country you would like your radiologist to be based in. Our US-based radiologists are all board certified and fellowship trained subspeciality radiologists from academic institutions. Our India-based radiologists are all board certified radiologists working at two of the largest, JCI-accredited hospital groups in India. How do I submit my second opinion request? To submit a second opinion request, you simply provide your phone number, and submit to us your scans and relevant clinical documents. Scans must be uploaded in the original format you received from the hospital or imaging centre that originally scanned you (either from a disc, thumb drive, or downloaded from a portal). Our radiologists will not provide a report based on JPEG photos, WhatsApp images, Facebook images, or other non-medical grade imagery. Once you have uploaded your images and any report documents, you can select your radiologists and will then be prompted for payment information. Payments are processed once the radiologist has accepted your second opinion report. Once the report is complete, you will receive an SMS notification with a link to your published report to the same mobile number you registered with. How long does it take to get a second opinion report? Once your images have been submitted, you can expect to have your second opinion report published in 24 hours. If we require additional time to have additional subspecialty radiologists review the study, we will let you know as soon as that information is known to us. How much does a second opinion cost? The price of the second opinion varies depending on the type and complexity of the study. Some studies take longer to review than others, or require radiologists with particular subspeciality expertise. In addition, radiologists in some countries charge different rates, so your country of choice may make a difference. Feel free to submit a pricing inquiry using the form above if you’d like to learn more. Payments can be made directly on our website with a credit card or debit card (Visa, MasterCard, or American Express) and in certain countries, with direct bank transfer or payment wallets. Can my report be sent directly to my referring physician? Yes, provide us his or her email address and name and we can directly share your results with the physician of your choosing. Can I send directly to a Radiologist of my choice? 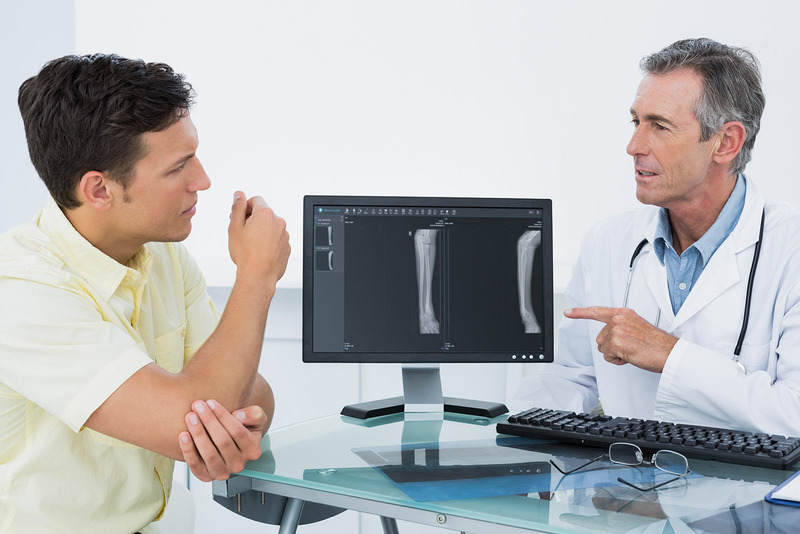 AlemHealth assigns your case to radiologists based on their subspeciality expertise and availability. If you have a radiologist in mind that you would like to have on our platform, please send us an email at invite@alemhealth.com and we will create an account for them. My Radiology Report says Everything is Normal But my Doctor says Differently. Radiology is one of many tools your doctor uses to diagnose your illness, and plays a very important role in the diagnosis process. However, for many conditions, there is no evidence on the radiographic images of your illness, even though you and/or your doctors know the illness exists. When a radiology report states something is "normal", the radiologist means that there are no radiologically visible signs of disease on the images provided that are clinically relevant to the doctor. Security is a very high priority at AlemHealth for all your healthcare data. All data between our servers and you is encrypted at rest and on transmission with at least 128-bit TLS, and all copies of daily backup data are encrypted with 256-bit AES encryption. Data is kept secure with multiple servers housed in Tier-3 HIPAA-compliant data centre that have strict access controls and real-time video monitoring of the data centre. How do you manage quality control? We undergo a strict credentialing programme to ensure that the radiologists on our platform are licensed and accredited to practice radiology in the US or their home country, and select only radiologists that are practicing at Joint Commission-accredited healthcare centres. In addition, all of our radiologists are subject to our quality control programme which includes random and focused overread reviews of studies. Yes, send us an email at support@alemhealth.com and we will help you with any issues you may have in sending us your radiology images. How do I upload an image that is just film? Unfortunately, we can only accept CDs or DVDs at this time in most countries of operation. However, if you provide us the name and number of the facility where you had your images taken, we can usually request the images directly from the centres. How do I upload images from a CD? When the screen prompts you to “Insert your medical images CD into your computer now”, insert your disc and click the “Choose File” button. If you want to upload all the images on the entire CD, select the CD itself, and click the “Upload” button. It should automatically begin reading your CD and adding the images to your account. Can I have access to my reports/medical records on your platform anytime? Yes, you can log in to https://alem.health and collect your results as soon as they’re available. Can you provide a final report? Yes, our reports are all reviewed and digitally signed by the radiologist reporting. Can you provide An Urgent or EMergency report? While we will alert you of any critical findings our radiologists encounter while reviewing your medical images as soon as we can, our service is not intended for emergency care. Please call your local emergency services or go directly to the Emergency Department if you think you're experiencing an immediately life-threatening condition or symptoms. Should you have questions about your second opinion report, please email questions@alemhealth.com with specific questions about your report and we will contact the radiologist on your behalf. Still have questions about second opinions? The teleradiology services made available through AlemHealth are provided by licensed radiologists practicing at independently owned professional radiology practices and hospital groups worldwide. These professional practices and hospitals provide services via the AlemHealth teleradiology software platform. AlemHealth does not itself provide any physician, radiology, or other healthcare provider services. If you think you're experiencing a life-threatening or severe condition, call your local emergency services or go directly to the Emergency Department. © Copyright 2018 AlemHealth Pte. Ltd.